Lynda Gratton at the London Business School gave one of the best Keynote speeches that I’ve heard all year. Her talk was a tour de force on how to catalyze innovation and one of her core recommendations really hit home for me: “If you really want to be at the cutting edge of innovation, then you better make sure that 20% of your team is under the age of 27.” Lynda upholds this principle in all her business ventures. I find this absolutely brilliant, which explains why I prefer teaching undergraduate seminars and why I always try to keep in touch with former students. Without fail, they continue to be an invaluable source of inspiration and innovative thinking. A former student of mine, Adam White, recently introduced me to another undergraduate student at Tufts University, Rachel Brown. Rachel is a perfect example of why I value interacting with bright young minds. She wants to return to Kenya next year to identify and connect local peace initiatives in Nairobi in preparation for the 2012 elections. I understood at once why Adam recommended I meet with Rachel: Ushahidi. I immediately told Rachel about Ushahidi, a free and open source platform that uses crowdsourcing to map crisis information. I suggested she consider using the platform to crowdsource and map local peace initiatives across Kenya, not just Nairobi. I’ve been so focused on crisis mapping that I’ve completely ignored my previous work in the field of conflict early warning. An integral part of this field is to monitor indicators of conflict and cooperation. There are always pockets of cooperation no matter how dire a conflict is. Even in Nazi Germany and the Rwandan genocide we find numerous stories of people risking their lives to save others. The fact is that most people, most of the time in most places choose cooperation over conflict. If that weren’t the case, we’d be living in state of total war as described by Clausewitz. If we only monitor indicators of war and violence, then that’s all we’ll see. Our crisis maps only depict a small part of reality. It is incredibly important that we also map indicators of peace and cooperation. By identifying the positive initiatives that exist before and during a crisis, we automatically identify multiple entry points for intervention and a host of options for conflict prevention. If we only map conflict, then we may well identify where most of the conflict is taking place, but we won’t necessarily know who in the area might be best placed to intervene. Documenting peace and cooperation also has positive psychological effects. How often do we lament the fact that the only kind of news available in the media is bad news? We turn on CNN or BBC and there’s bad news—sometimes breaking news of bad news. It’s easy to get depressed and to assume that only bad things happen. But violence is actually very rare statistically speaking. The problem is that we don’t systematically document peace, which means that our perceptions are completely skewed. Take the following anecdote, which occurred to me several years ago when I taught my first undergraduate course on conflict early warning systems. I was trying to describe the important psychological effects of documenting peace and cooperation by using the example of the London underground (subway). If you’ve been to London, you’ve probably experienced the frequent problems and delays with the underground system. And like most other subway systems, announcements are made to inform passengers of annoying delays and whatnot. But unlike other subway systems I’ve used, the London underground also makes announcements to let passengers know that all lines are currently running on time. Now lets take this principle and apply it to Rachel’s project proposal combined with Ushahidi. Imagine if she were to promote the crowdsourcing of local peace initiatives all across Kenya. She could work with national and local media to get the word out. Individuals could send text messages to report what kinds of peace activities they are involved in. This would allow Rachel and others to follow up on select text messages to learn more about each activity. In fact, she could use Ushahidi’s customizable reporting forms to ask individuals texting in information to elaborate on their initiatives. Rachel wants to commit no less than a year to this project, which should give her and colleagues plenty of time to map hundreds of local peace initiatives across Kenya. Just imagine a map covered with hundreds of doves or peace dots representing local peace initiatives? What a powerful image. The Peace Map would be public, so that anyone with Internet access could learn about the hundreds of different peace initiatives in Kenya. Kenyan peace activists themselves could make use of this map to learn about creative approaches to conflict prevention and conflict management. They could use Ushashidi’s subscription feature to receive automatic updates when a new peace project is reported in their neighborhood, town or province. When peace activists (and anyone else, for that matter) find peace projects they like on Ushahidi’s Peace Map, they can “befriend” that project, much like the friend feature in Facebook. That way they can receive updates from a particular project via email, SMS or even Twitter. These updates could include information on how to get involved. When two projects (or two individuals) are connected this way, Ushahidi could depict the link on the map with a line connecting the two nodes. Imagine if this Peace Map were then shown on national television in the lead up to the elections. Not only would there be hundreds of peace dots representing individual peace efforts, but many of these would be linked, depicting a densely connected peace network. 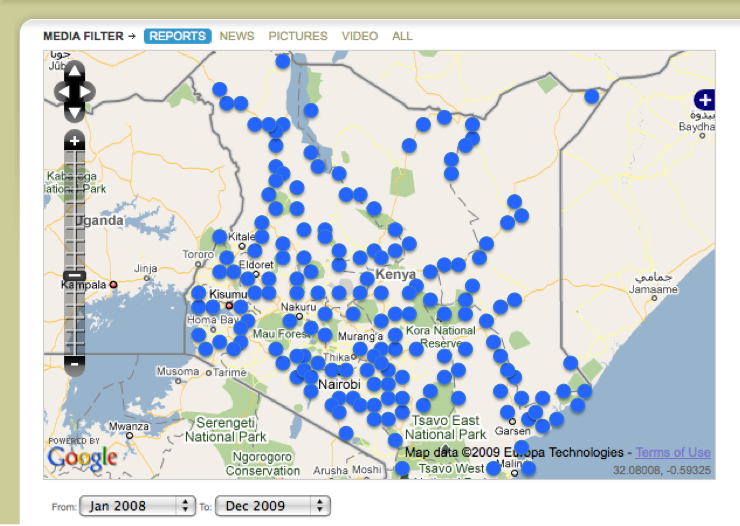 The map could also be printed in Kenya’s national and local newspapers. 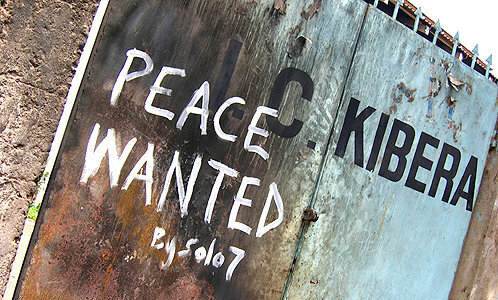 I think a Peace Map of Kenya would send a powerful message that Kenyans want peace and won’t stand for a repeat of the 2007 post-election violence. When the elections do happen, this Peace Map could be used operationally to quickly respond to any signs of escalating tensions. Rachel could use the Peace Map to crowdsource reports of any election violence that might take place. Local peace activists could use Ushahidi’s subscription feature to receive alerts of violent events taking place in their immediate vicinity. They would receive these via email and/or SMS in near real-time. This could allow peace activists to mobilize and quickly respond to escalating signs of violence, especially if preparedness measures and contingency plans already in place. This is what I call fourth generation conflict early warning and early response (4G). See this blog post for more on 4G systems. This is where The Third Side framework for conflict resolution meets the power of new technology platforms like Ushahidi. It is when I meet inspiring students like Rachel that I wish I were rich so I could just write checks to turn innovative ideas into reality. The next best thing I can do is to work with Rachel and her undergraduate friends to write up a strong proposal. So if you want to get involved or you know a donor, foundation or a philanthropist who might be interested in funding Rachel’s project, please do email me so I can put you directly in touch with her: Patrick@iRevolution.net. In the meantime, if you’re about to start a project, remember Lynda’s rule of thumb: make sure 20% of your team is under 27. You won’t regret it. This entry was posted in Lessons and tagged Crisis mapping, Early, early warning, ushahidi. Bookmark the permalink.